First Dates: Celebrity Special for Stand Up to Cancer (Channel 4, 9pm) Charity special where the singletons unwittingly meet celebrities. Brett: A Life with No Arms (BBC1, 10.35pm) Follow-up documentary to the 1965 film about a four-year-old born with no arms, catching up with Brett Nielen 50 years later. DIY SOS: Homes for Veterans (BBC1, 8pm) Special episode where the team renovate empty properties in Manchester to home military veterans. Hosted by Nick Knowles. Restoring Britain's Landmarks (Channel 4, 8pm) New series looking at renovations and the history of some of the UK's top landmarks. ★ Grand Tours of the Scottish Islands (BBC2, 7pm) Travelogue with Paul Murton. 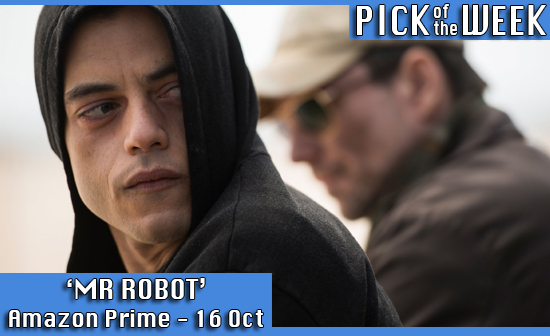 ★ Mr Robot (Amazon Prime) Season 1 of the U.S drama about a mentally troubled computer genius who joins an underground hacktivist movement to end global capitalism. Starring Rami Malek, Carly Chaikin, Portia Doubleday, Martin Wallström & Christian Slater. ★ The Jonathan Ross Show (ITV, 10.15pm) Series 9 of the chat show. Guests are Vin Diesel, Jessica Ennis-Hill, Harry Enfield, Paul Whitehouse & Tom Jones. ★ This World (BBC2, 6pm) Factual special where Hans Rosling presents amazing stats using state-of-the-art 3D graphics to portray how the world is rapidly changing.